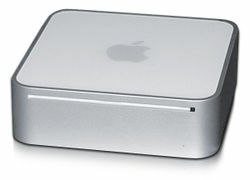 Mac mini is the smallest desktop computer from Apple Computer which is designed to attract owners of Windows computers, iPods, older Macintosh models, and anyone interested in a low budget, easy-to-use personal computer. Mac mini has the size of only 6.5 inches square and 2 inches thin. Originally Mac mini was powered with IBM PowerPC G4 processor, and since February 28 2006, Mac mini has features Intel Core Solo processor with combo optical drive (DVD-ROM/CD-RW) or Intel Core Duo processor with double-layer SuperDrive (DVD+R DL/DVD±RW/CD-RW). Mac mini specifications feature 2 PC2-5300 DDR2 SDRAM in SO-DIMM form factor RAM slots, integrated Intel GMA950 GPU, four USB 2.0 ports, one FireWire 400 port, 10/100/1000BASE-T (Gigabit) Ethernet, analog and S/PDIF audio input and output, DVI video output, AirPort Extreme for Wi-Fi connection (802.11g), built-in Bluetooth 2.0+EDR, Front Row, Apple Remote, iLife which consists of iPhoto, iMovie, iDVD, GarageBand, .Mac and iMac.2, Intel Virtualization Technology (VT-x) enabled and ability to dual-boot between XP and Mac OS X with Apple Boot Camp. HEXUS.lifestyle awards Apple Mac mini innovation award and picks Mac mini as editor’s choice, and concludes that “we’d be happy recommending this Intel-powered Mac mini to any friend or relative and to HEXUS readers, too, except those who are potential power users or big-time games players. For most people, though, a mini could be the perfect choice – irrespective of what operating system they wish to run (apart from Unix). It’s an easy-to-use, high-quality personal computer that takes up next to no room, works quietly and gives off no significant amount of heat. An Apple mini is, we believe, a far better option for most people than a laptop – the choice that many people now make not because they’re road warriors but simply to avoid having a big system box cluttering up the house. Macworld reviews Intel-based Mac minis and offers the buying advice that “the Mac mini Core Duo’s built-in improvements and performance boost are worth the higher cost. And although the Core Solo model clearly underperforms compared with the Core Duo in almost every respect, it’s still a good entry-level Mac for the money. As with other Intel Macs, non-native software performance for both models suffers when compared with previous models, and the integrated graphics chip diverts valuable system RAM. If you like to have many applications open at once or use RAM-intensive apps, we recommend one of the build-to-order upgrades. PC Magazine reviews Apple Mac mini (Intel) and concludes with rating of 4 out of 5 that the new Apple Mac mini has the Intel Core Duo processor, and adds Front Row, wireless 802.11g, and Bluetooth. It’s a good fit as a media extender or a second system for living room or bedroom use. CNet reviews Apple Mac Mini Core Duo and concludes with rating of 7.5 out of 10 that Apple packs more media-specific features into the Mac Mini to make an inexpensive and useful entertainment-room computer. It’s tremendously easy to use, although it surprised us with poor image processing.